Ok you guys, I think I may have found my favorite bread recipe ever. Ever ever ever. And ever is a big deal when you love bread as much as I do. Big. Huge. 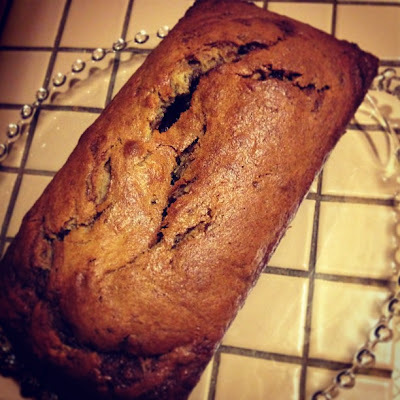 Three words - banana Nutella bread. I found the recipe on Ramshackle Glam and had to make it immediately. I literally started baking about 30 minutes later. The results? Oh my goodness. I don't think I have words. And that's saying something. I hope you like the recipe as much as I do! And if you don't...well...I've already eaten over half of the loaf I made. So there's that. 2. Stir flour, baking soda and salt together in a bowl. 3. In another bowl, beat sugar and butter. Stir in eggs one by one. 4. Add banana, milk and vanilla to the mixture of sugar, butter and eggs. Stir until blended. 5. Gradually add flour mixture. Stir until blended. 6. Place Nutella in a dish and warm in the microwave until soft. Add some of your batter (1/2 cup or so) to the Nutella mixture and stir. 7. Begin pouring batter into baking pan. Gradually pour Nutella mixture into the pan, stirring with a knife to achieve a swirl throughout the pan. Continue alternating batter and Nutella. 8. Bake for 55 - 60 minutes. Remove the loaf from the oven and turn on a wire rack to cool completely so the loaf won't continue baking in the pan. 9. ENJOY. With milk. Lots and lots of milk. Dying. Step 10 is my favorite. I'll be making it this weekend!